It is so difficult to add to speeches so eloquently said by everyone tonight, and I do agree with all the sentiments expressed. Let me just say a few words in conclusion. First, I want to thank Baroness Cox on behalf of the President and the people of Armenia. They say ‘a friend in need is a friend indeed,’ and Lady Cox has supported and inspired the Armenian people in Artsakh from the very beginning of their struggle. Your support of Artsakh and your Christian spirit was greatly of great moral assistance to all Armenians; it still means a lot to every Armenian. I also want to thank a prominent legislator from another great English-speaking country, Representative Pallone for his permanent and steadfast support of Armenia, Artsakh, and issues of concern to the Armenian-American community. We are here to pay tribute to the visionary mission and activities of the Armenia Fund that in many ways contributed to the revival of the newly independent Armenian state. Since the early years of independence, the infrastructure projects of the Fund made a crucial difference for tens of thousands of people in hundreds of Armenian communities in Armenia and Artsakh. Artsakh, of course, is such a potent symbol of the latest chapter of Armenians’ struggle for freedom and independence that is dear to the hearts of all Armenians and, as Baroness Cox and Representative Pallone can testify, of many foreigners as well. Artsakh persevered in its quest for self-determination despite the foreign aggression and destruction of war, and we all hope for a timely, just, and lasting resolution to the conflict. I want to acknowledge the President of Nagorno Karabakh, Arkadi Ghukasian, who is visiting the United States on a working visit, and wish him success during his stay and meetings in this country. One of the most visible projects of the Hayastan Fund is the highway of life linking Armenia and Artsakh; another highway project is currently underway. The health of its citizens is a good indication of the strength of a country; and the Diagnostic Center in Artsakh – one of the reasons for today’s Gala – needs your support and contributions. 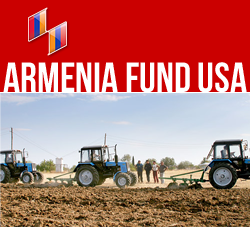 The success story of the Armenia Fund would be incomplete without honoring the major donors who over years so generously supported the Fund. So, I want to thank all the donors of the Armenia Fund for their support and their faith in the success of independent homeland. All donors of the Fund can draw satisfaction from the knowledge that their contributions have been well invested in Armenia’s future. As the economy in Armenia and Artsakh improves, the government and local citizenry can and will assume a larger share of infrastructure-related expenses, but there will always be room for benevolent activities. So, support the Diagnostic Center of Karabakh today; keep Armenia and Artsakh in your hearts and minds; and together we will the homeland secure and prosperous.